In preparation for winter, I have ordered winter tires and put them on the stock Enkei wheels. I’ve been shopping for summer wheels for the stock summer tires, and ended up deciding that the forged BBS wheels from the STi Limited look best and are better quality for the money than aftermarket wheels at used prices. Hopefully this doesn’t make me a poser by making my car look like it has the Limited trim, but I don’t really care because I like these wheels a lot. They’re the same specs as the stock Enkeis, but shinier. My used set has curb rash on one of the wheels, which I might repair, or I might leave it as stress relief. The biggest competition I was considering was the brand new APEX EC-7 wheels designed specifically for the WRX/STi. 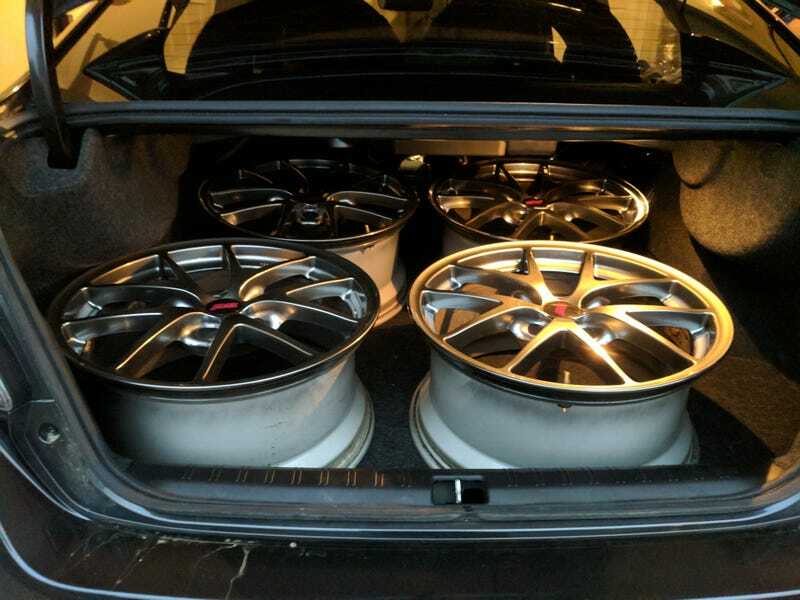 I had EC-7s on my 135i and loved them. In the end, these BBS wheels were much cheaper and didn’t require any tire stretch or outright new tires. My noisy Dunlops live on to see another day. Also, shout out to the practicality of the STi. It may not be a hatch (Boo! ), but it was able to comfortably hold 4 wheels and 4 tires with a completely open passenger seat. Fitting 4 mounted wheels/tires was cake. There might just be something to this practicality thing everyone is always on about. Eh, still won’t stop me from cross-shopping S2000's, Elises, and MR2's.